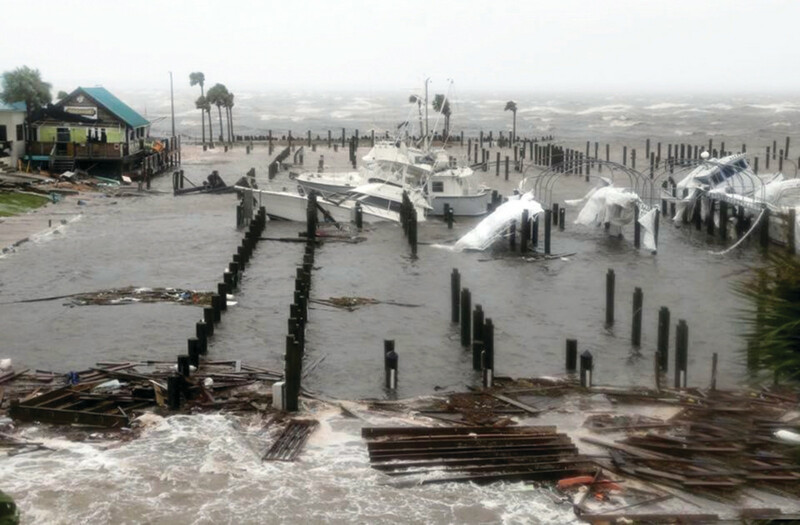 Powerful winds and a potent storm surge claimed boats at this marina in Port St. Joe, Fla.
Before Hurricane Michael made landfall, Capt. Ryan Kelley, owner of Southbound Charters in Mexico Beach, Fla., hauled his 36-foot Contender. He trailered the center console to a spot about 15 feet above sea level because the forecast called for a 9- to 10-foot storm surge. Kelley evacuated about 60 miles north of Mexico Beach, where Michael struck with 155-mph winds and a 9-foot surge. Blackburn couldn’t get back to his boat because most of the roads around Mexico Beach were impassable. Sections of Highway 98, the primary coastal road that runs east and west on the Florida Panhandle, were destroyed. Capt. Justin Steele took his 48-foot Viking, Blue Water Connection, from Panama City Beach, Fla., to Orange Beach, Ala., to wait out the storm. A day after Michael struck, he headed back to Capt. Anderson’s Marina to see how it had fared. “A lot of people stayed, and from what I understand, probably half the boats in that marina are lost,” Steele says. Marinas and dealerships in the area didn’t fare as well as the charter businesses. Pirate’s Cove, Treasure Island and Lighthouse Marina, all in Panama City, either lost their dry stack buildings or they sustained significant damage. Video of Pirate’s Cove after the storm was all over social media; a large section of the dry-stack roof was missing, and the boats inside were in a pile. OneWater Marine owns nine marinas and dealerships in the Panhandle. Legendary Marina and Sunrise Marine flank Pirate’s Cove and came through the storm with minimal damage, Cunningham says. At the Legendary Marine in Destin, employees moved more than 700 boats inside, and the dry stack building held up well in the 50-mph winds recorded locally. There was some damage on the docks, but it was nothing compared to Panama City Beach. OneWater implemented its 72-hour hurricane plan on Oct. 8. Matt Mueller manages the Freedom Boat Club franchise based at Lighthouse Marina in Panama City Beach. He evacuated to Gulf Breeze, Fla., Oct. 9 when the storm escalated. “Category 4 was not what we were expecting,” he says. Chris Jennings owns Panama City Beach Paddleboard Rentals. His home was built to withstand a Category 4 storm and fared well in the storm, as did his business. At MarineMax Panama City, employees were trying to access the dealership, but hazardous road conditions made travel difficult. All team members were accounted for, and the company asked customers to check its Facebook and Web pages for updates. Reports put the death toll at 14 two days after the storm, and roughly 2 million people were without power from Florida to Virginia, with more than 500,000 powerless in Virginia alone. The water temperature in the Gulf of Mexico was 87 degrees. “It damn sure gave that storm what it needed,” Steele says. Some people were caught off guard by how quickly the storm strengthened, but the forecasts, by most accounts, were accurate. Michael was a Category 2 hurricane on Oct. 9 and was just shy of Category 5 when it made landfall the next day as the fourth strongest hurricane to strike the United States. Its steering winds also were higher than recent storms, tracking at 12 mph in the days leading up to landfall. By the time Michael left the Carolinas, it was moving at more than 20 mph.